Have you dated this woman? 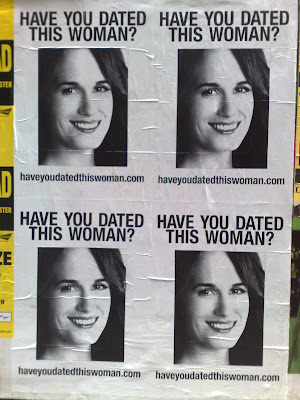 I saw a poster today that asked the question 'Have you dated this woman?' with a web address of haveyoudatedthiswoman.com. I'm sorry I missed you. Let’s get together on Friday at 9. Until then please leave me a message"
with visitors allowed to leave comments. Not sure whether it's my sort of programme, but I like the idea of using underground activity / flyposting to drive users to a specific URL, then allowing users to comment and share the video or trailer clips through their blog or social network. i saw this on a poster taped to a pole with the little pull tabs. i save one of the tabs. the number is 1-877-7-BELLA1, if anyone is interested.